There really isn't one best dog food. 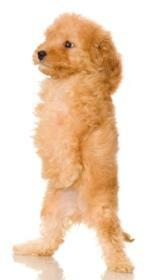 Some poodle owners prefer dry, others prefer canned or semimoist dog food. Still others prefer homemade dog food. Semimoist food is dog appealing but watch out for greater amounts of preservatives, sugar and food color than the other dog food types have. It's more expensive than canned and dry. Kibble is good for toy poodles. It's smaller and denser and gives them the extra calcium and phosporous they need. Toys need more energy from food than standard poodles do. 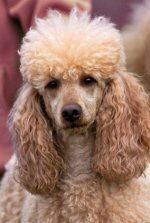 For poodles with special dietary needs, you can buy hypoallergenic or low calorie diet foods for him. What about adding vitamins for dogs and dog minerals to your pup's food? It's usually not necessary if the food you're feeding him is balanced and complete. Ask your vet whether supplementing your adult dog's diet is necessary. Also talk to your vet if you feel your poodle needs a special diet. Holly refused to eat any dog food, preferring boiled lean hamburger as her "main" meal. If you have a finicky eater, supplementation may be necessary to maintain health. Stay away from high doses of sugar, food coloring and preservatives. And treats? They're fine in moderation. Consider these as part of her meal. If you'd like to homecook her food, supplementation may be necessary. Ask your vet. Barley, rice and oatmeal are grains to use if home cooking. You'll need to cook her vegetables (NO onions). Liquid baby vitamins blend easily into cooked veggies. Veggies must be cooked for your dog to break them down. What to feed your pet is a personal preference. While cost may be a factor for some, be sure to consider the nutritional value in whatever food choice you give to your poodle.